Launching a new website is always an exciting experience for Zynke and our clients, whether it is a brand new design or an update to a previous website. Each website we design and develop comes with its own set of challenges which we tackle to ensure positive results for our clients. When we are charged with designing, coding and launching a website we must also recognise that we have a responsibility to our clients to ensure that best practices are followed and the design and build process runs as smoothly as possible. 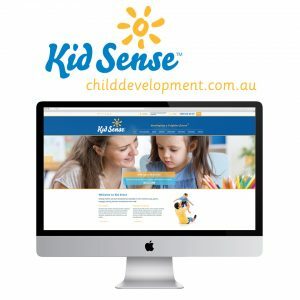 Recently Zynke re-designed and developed the Kid Sense Child Development website which was previously created by Zynke in 2011. This website presented its own challenge, even before the website was designed, as we found out, Kid Sense Child Development was very highly placed in desired Search Engine results. Ranking highly in relevant search engine results is always the end-goal of a website. This extra traffic showcases the website, company and brand to a larger audience, which in-turn improves turn-over and brand presence. Knowing childdevelopment.com.au ranked well presented additional challenges. We had to deliver a site that had to not only look good, function correctly with easy-to-use navigation but we also had to ensure that the new site did not jeopardise the existing search engine ranking. Working with the Kid Sense team, Zynke partnered with Eben of Nicholls Web Consulting to compile a detailed analysis and report on the existing site. Knowing why a site is ranking so highly helps us determine what we can do within the new website to ensure that it will not slide down the Google rankings once the new site is launched. This involved us all taking extra precautions and steps when copying the information from the old website to the new, as well as when we added new content and features to the site. We used a series of tools built into the back-end of the new Content Management System to ensure each article and post on the new website would follow best practices. This involved us looking over seemingly minor details, such as ensuring the content was ordered in a correct hierarchy, with headings given the correct code designation and that they were worded correctly as per the old website. Where pages were moved, redirects were put in place from the location on the old website to the location on the new. It is the small details such as these that can potentially be over-looked that can really help ensure a website does not drop in rankings. The attention to detail ended up making a significant difference to the overall build of the website, and knowing what needed to be done throughout the build process, coupled with the help and recommendations from Eben helped give us confidence that the website would perform as good as, if not better than before. Working with an Search Engine Optimisation (SEO) expert who we trust means that we know what we are doing with a website design will translate to good search engine results. Not only will we have the best chance of creating a website that helps a client’s ranking but we also know that results will be measurable and the clients brand integrity remains intact. We know all too well how many misleading and untrustworthy supposed ‘SEO experts’ are out there and we feel we have struck gold working with Eben – knowing that his values align with our own: That is to say that there is no ‘quick-fix’ when it comes to SEO and that it is an organic process that takes work and patience to ensure your website builds a strong ‘reputation’. Any quick fixes or people promising the world can often result in longer term pain, costing money in both the short and long-term. Building a strong long-term online reputation and following best practices, rather than trying to apply quick fixes helps to define your website as an ‘authority’ for particular search terms, which in-turn boosts your rankings. Zynke are pleased with the process of launching the new Kid Sense website and are really happy with the overall look and performance of the site. We continue to monitor the performance of the site and will continue to work closely with Eben and Kid Sense to ensure that their website will reach its full potential, as well as become a significant brand asset for the business.